Last year, Keith & Sharon Boothroyd, a husband and wife team from West Yorkshire, launched a project to help raise funds for the RSPCA. It's an e-book anthology called Paws For Thought. There's a wide selection of short stories – from ghost, crime and twist in tales, to the light- hearted and upbeat. And of course, there are stories that feature animals. 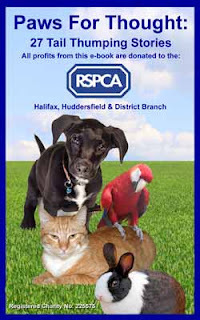 All income raised from kindle sales of Paws For Thought will be donated to the RSPCA Halifax, Huddersfield & District Branch. As our e-book is a charity anthology, we have a variety of work from published top short story magazine writers, including: Pasty Collins, Fran Tracey, Tara Westgate, Alan Williams, Beatrice Charles and Jacqui Cooper.